That was 2005 but now it's 2013 The need is only more critical in the much more complex & "consumerism" oriented world that we live in. I'm also much older (and crankier) and a lot less patient. My oldest son just graduated high school in Ontario and despite regular/intense questioning, he could not recall any mention of Money Management, Interest, Borrowing, Saving, Investing, Budgeting or Planning in any of his courses except for Accounting. I'm glad they came up in accounting because I'm an accountant-those kinds of topics should come up in accounting. But not every student feels inspired (or pressured) to take accounting. And that would be OK except for the fact that my son indicates that he saw no hint of money $ or financial management matters in any of his other subjects in an apparent yet say Integrated Way. And for the record, he has a pretty perfect attendance record; He was not away the day they spoke about money & finance. But, my son is one of the lucky ones. He took accounting and so he learned about how to account for money. His Mom is is an accountant and his Dad is in finance; so we can help him with the rest. We also talk about money on a regular basis. But what about all of the other students? The need is more than clear than ever for youth to have adequate financial literacy skills. 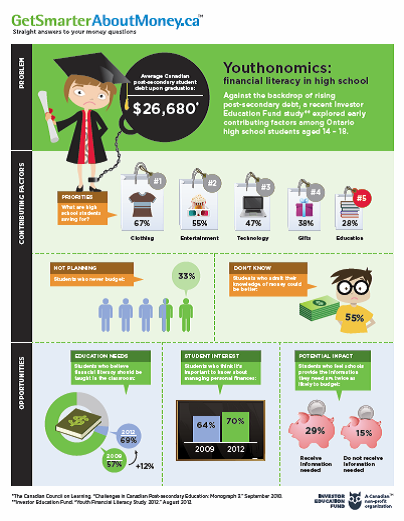 It's critical to the 46% of Youth who are predicted to start a business after graduation. It’s critical because life is a lot more complicated these days, where “consumerism” is rampant, marketing is aggressive & excessive, Credit Card applications are easy to come by and even the Government is in the business of supporting Gambling in the form of tickets, Online betting, Bingo & Slots. It’s critical for students to learn basic if not intermediate skills, to become good consumers and navigate the good from the bad; because, let's face it "Everyone is after your money". But Financial Literacy Education is critical to future economy of our Province and our Country. So why is it not happening yet? So why is it not happening yet? What is taking so long? Yes, Overall-It looks like very little if any progress 3 years later despite all the talk all the research and all of the recommendations of the Financial Literacy Task Force. We are failing our Youth badly despite the act that there are ways to deliver Financial Literacy efficiently and effectively without any further delay. The question for me is Why are we not using them? We could deliver this need effectively and efficiently using technology that exists today. Technology is changing the way we do everything else we do today; including healthcare so it seems like a natural solution. Unbiased Professionals and Organizations can deliver this need effectively and efficiently using technology that exists today. 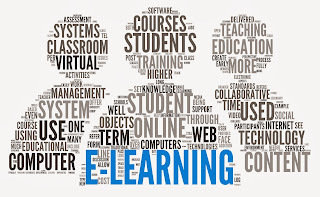 The Internet is plentiful with great examples of outstanding e-learning opportunities & solutions. With the help of unbiased professionals and financial organizations, Ontario and other provinces across Canada could deliver a National Financial Education Program using e-Learning. 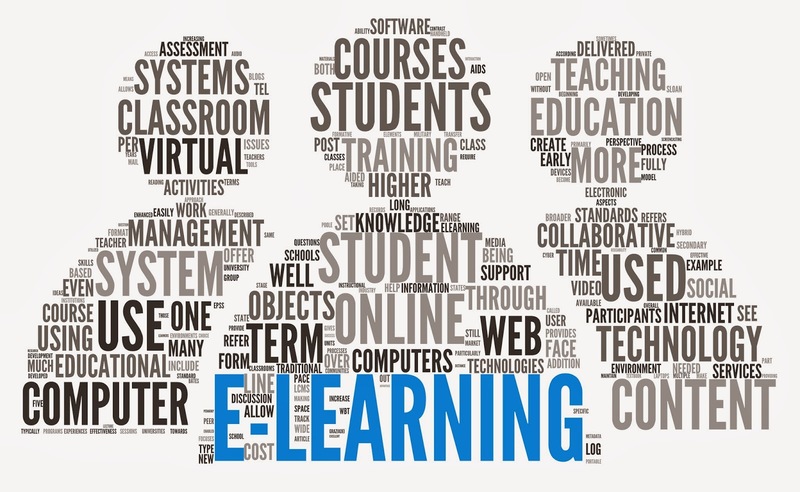 e-learning is would benefit youth who have grown up in a technology enabled world. And, while I'm not an expert, I believe e-learning offered in a classroom setting ("blended learning") offers additional benefits. Teachers already have the experience required to facilitate active discussion and learning but the challenge of educating teachers on how to deliver financial literacy education, in a more traditional way, would stop being an obstacle to educating our youth. Research has shown that blending online learning with classroom time is the most effective way to learn. It's more Cost effective in a number of ways. I'm an accountant; no reason to bore you with the details here. It's Consistent. Regardless of the Province or the School Board or the School, education would be consistent and equalized thanks to an Internet connection. This is a BIG one. Tracking progress is generally built into e-learning programs. Standardized testing is a given but e-learning lends itself to knowing when a student is having difficulty with a particular topic without them having to raise a hand. This would be an advantage to all learning. Less 'teacher talk' and more 'student talk'. Who doesn't like to hear their teacher talk but sometimes, you can learn more effectively when information is shared between students ideas are exchanged. E-learning makes that possible. A great example of an organization already delivering Financial Literacy Education is the Khan Academy who has done outstanding work in other areas of education. They have partnered with the Bank of America on a financial literacy project they call Better Money Habits. I would encourage you to check it out. This is again, just one example of the quality that already exists of e-learning for financial literacy education. Delivery of financial literacy education effectively and efficiently using technology can happen with collaboration between the various non profit financial organizations that have joined together to help move financial literacy forward and the appropriate Federal & Provincial Agencies & Departments involved including those involved in Education. I think we can find and prioritize opportunities in the current curriculum for such critical education; given the importance we all acknowledge it to be. But if Ontario is looking for a suggestion I would suggest a natural place for it to be placed would be to add it into the Grade 10 Semester where students currently learn about Careers and Civics. Splitting the semester by 3 instead of 2 would seem to make sense to me given the state of Civics at this particular point in time in Canada; it would certainly make sense. I think there is no debating required; Financial Literacy is more critical. However, I would also argue that being financially literate is required when you have a career; and we hope all youth find a career. As well, being financially literate involves being an active citizen and a smart consumer; which would marry it well within Civics. Much work to be done for the sake of youth and the economy of Canada in general... Can we afford to wait? More than half of the countries surveyed believed that their youth do not understand finances. Canada, the US and Bosnia had the worst opinion of the level of financial literacy that their children have-with 70% saying their teens don't understand money management basics. Both in the US and Canada approximately 56% of households do not have a budget. 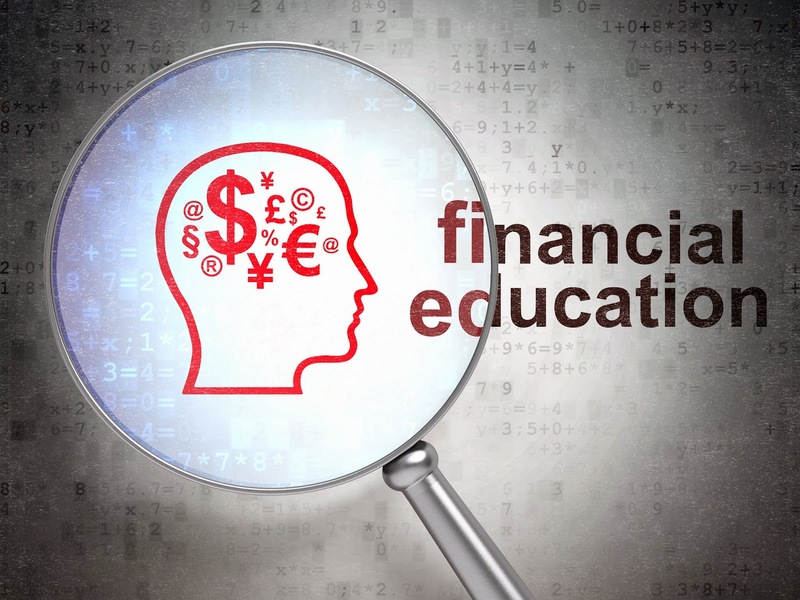 In the US, Only 13 States (in 2012) have made a personal finance course mandatory in school. What are the requirements across Canada. We will reach out to find out. 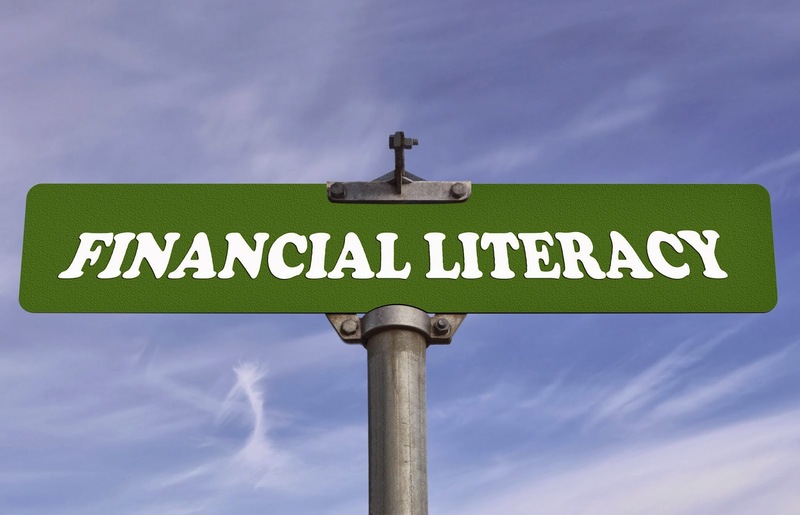 We know in Canada...Financial literacy education is not happening to any great extent or to any extent of where it should be for the benefit of our next generation. 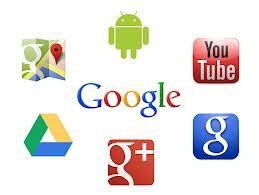 Digital Estate Planning-Is Google your Next Estate Planner? Legacy Tracker is a web based solution that helps individuals and families safely track, monitor and share important financial and legal information in a single, secure place thereby reducing the risk of loss while allowing for better and more proactive financial planning and decision making. Legacy Tracker. Simple theme. Powered by Blogger.